Last spring, just before Cinco de Mayo, I was at the cheese counter at the Porte des Alpes Auchan and they had real cheddar cheese. It was a sharp cheddar cheese, but not the vintage aged cheddar we usually get. 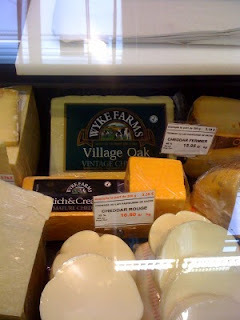 The next time I stopped by, thinking I would get some to put on my chili, it was gone, nothing but the vintage cheddar. So I asked the guy at the cheese counter if they would be getting any back in. He proceeded to tell me they had the yellow kind just because they could get any of the "good" cheddar, and wouldn't be having any more of that "other" cheese. I must have left an impression when I very emphatically and repetitively told him that the "other" cheese WAS the good cheddar cheese, because now they have both all of the time. They are calling them cheddar rouge, and cheddar fermier. Not only that, they now have Mole, Kikkoman Teriyaki Sauce, Old El Paso Chili con Carne, Cranberry sauce, and Betty Crocker Bisquick. So NOW I know why I miss going to Auchan vs Carrefour!